* This recipe calls for puff pastry instead of the traditional brioche bread recipe. 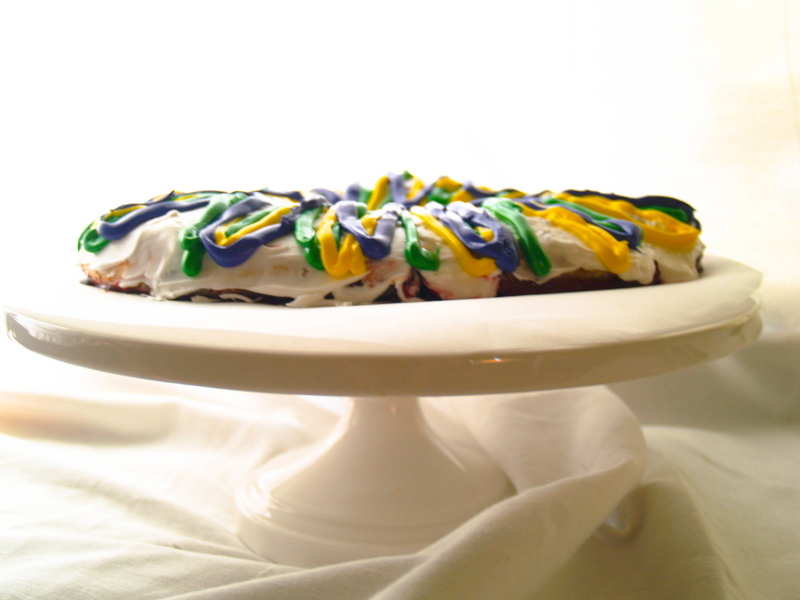 Also, most king cakes use purple, gold and green colored sugars, but I use colored royal icing. 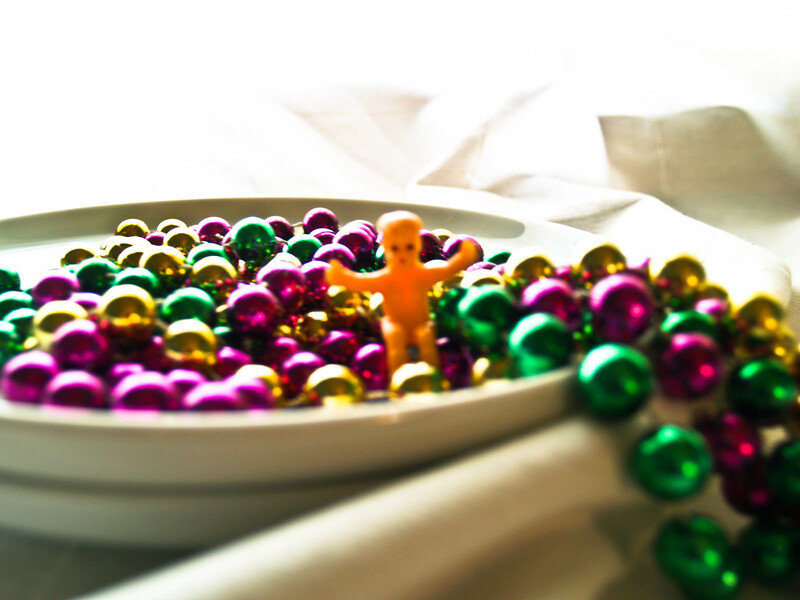 The grocery store that practically all of my king cakes came from in southwest Louisiana, Market Basket, used icing instead of sugars to decorate their cakes. Roll out pastry on a lightly floured surface. Lay two sheets of pastry side by side and crimp the two pastries together. Makes sure that there are no seams. Leaving a 3-inch border, brush the melted butter onto the pastry, and then sprinkle on both brown and white sugar. Layer the cinnamon on top of the sugars. Press down lightly with your fingers. Add the filling on top of the sugars and cinnamon. Starting with the end closest to you, gently roll the pastry up jellyroll style. Connect both ends together to form a circle with the pastry. Transfer to a cookie sheet layered with parchment paper. Brush egg wash onto the pastry and bake for 25 minutes or until brown. Let cool for at least 15 minutes before icing the cake. Combine the sugar and egg white in a mixing bowl with a whisk attachment. Whisk together until shiny and can hold its shape. Add the lemon juice (add more if the icing is too thick). Take 3 mugs and line them with Ziploc bags. Spoon 2 tablespoons of white icing in each mug. Add the 3 different color gels in the 3 individual mugs. Close the bags and mix the color into the icing until you have the desired hue. Once the cake has cooled, put a thin layer of white icing. Push the icing to a corner of the bag and snip a tiny piece of the corner off. Gently squeeze the icing onto the cake, one color at a time until you have all 3 colors displayed onto the cake. Let the icing harden slightly before serving. This is fantastic! I love the colors and the flavor and taste! It’s all good, down to the baby James sneaking around inside the cake! It’s cool for us to have a traditional cake for our holiday in Louisiana, growing up with it around, it’s only natural 🙂 Bon Travail! !